Individual voices amplified by a community of shared values and perceived power can affect change. 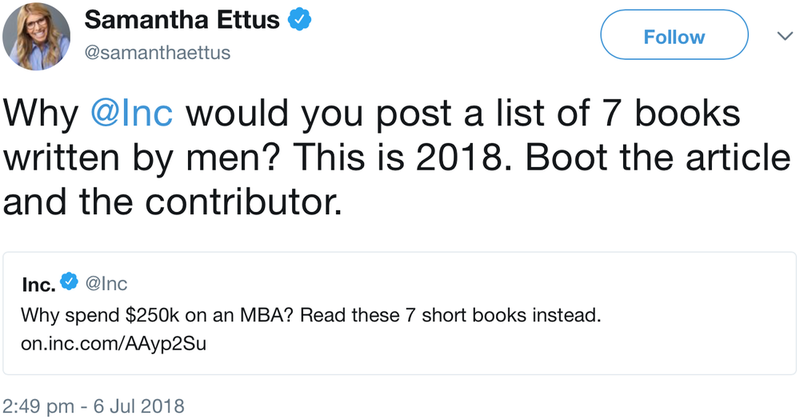 Bestselling author, writer, speaker and call-in radio show host Samantha Ettus called out Geoffrey James for his Inc.com article, “Seven Short Books Worth More Than an MBA”. All seven books featured were written by men. Fantastic GenderAvenger supporter Cindy Gallop alerted us to James’ article. We decided that the GA community needed to know about this, so an Action Alert went out, and the community raised the stakes for James. He responded with a series of tweets like these that ranged from defensive to combative. I'm not entirely certain an obscure post I wrote years ago is worthy of this much attention when we are, in fact, in a very difficult period of history where everyone's fundamental rights are under attack. But in truly awesome GenderAvenger fashion, you didn’t let James off the hook, and l the tweets kept a comin’. Two days later, James wrote another full-length piece for Inc.com, “How Book Publishers Shortchange Women Authors”. In the very first paragraph, he acknowledged that “In retrospect, it [the original tweet] was a valid complaint but when I tried to clarify the situation via Twitter, I botched the job, hence this post.” James made strong points and provocative statements, touching on a subject I have written about, the questionable value of women-only events and lists, which is a complicated but worthwhile discussion to have. Whatever you may ultimately think of Geoffrey James — my own opinion improved — he is now part of the unfolding story of GenderAvenger. We shared notice of his article and had many subsequent exchanges with our community, allowing loads of folks to help generate attention about the importance of gender balance. That attention not only helped educate the author, but it also let readers of Inc.com know that the topic is important enough for the magazine publish a follow-up to its misguided original piece. That’s the way larger cultural and structural changes begin and continue to grow. Our GenderAvenger community continues to raise their voices for better representation of women in public dialog, and Geoffrey James joined those voices, however imperfectly, by continuing such a complex and important conversation.